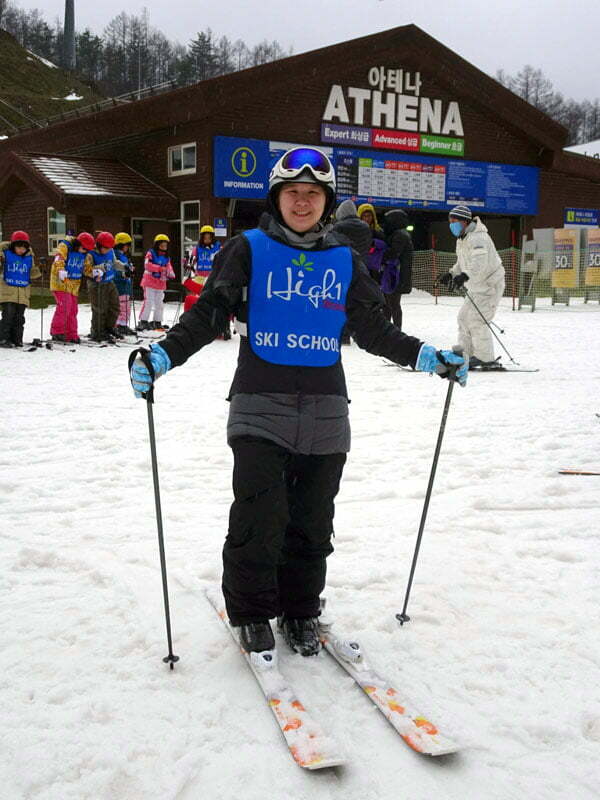 Love skiing and the idea of a blissfully snowy holiday? I loved the chilly temperatures of Vancouver and the Christmas spirit of Munich, but you don’t have to travel so far just to experience a proper winter holiday. 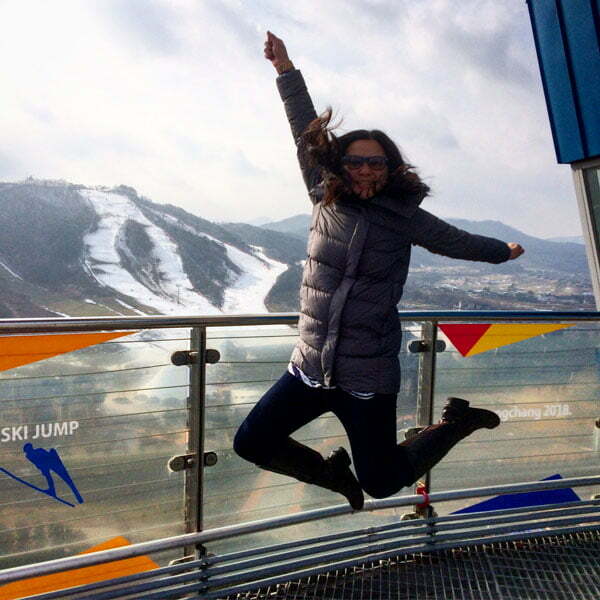 The Korean Tourism Organisation invited me up in mid December at the start of ski season to check out what the neighbouring Gangwon region has to offer the winter-loving traveller – here’s how to properly welcome the winter season in Gangwon. I have spent most of my time exploring Seoul to date, so I was pretty excited to see some new bits for a change. 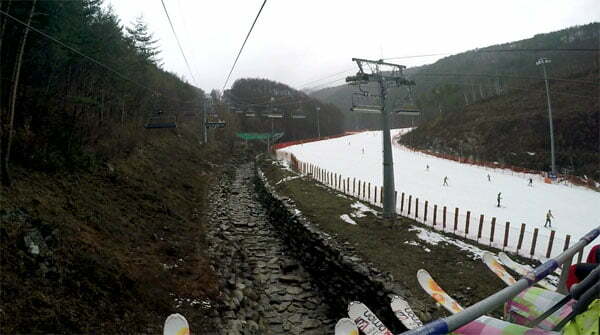 The regions of Gangwon is located in the Northeastern corner of South Korea and mostly filled with mountains. 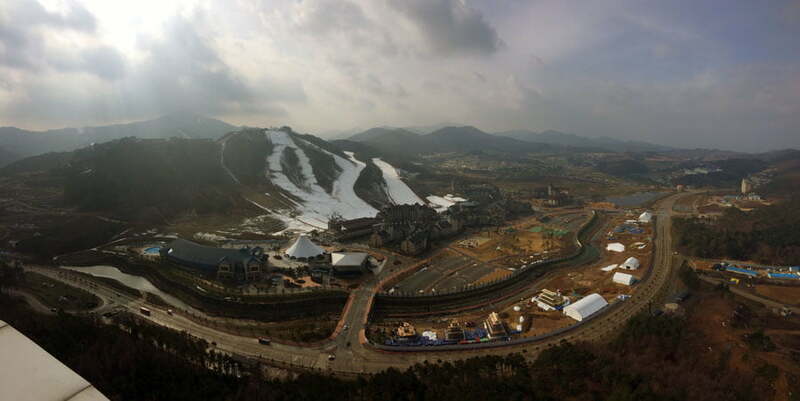 It is also home to Pyeongchang, the venue for the Winter Olympics 2018, which we got to preview as well. 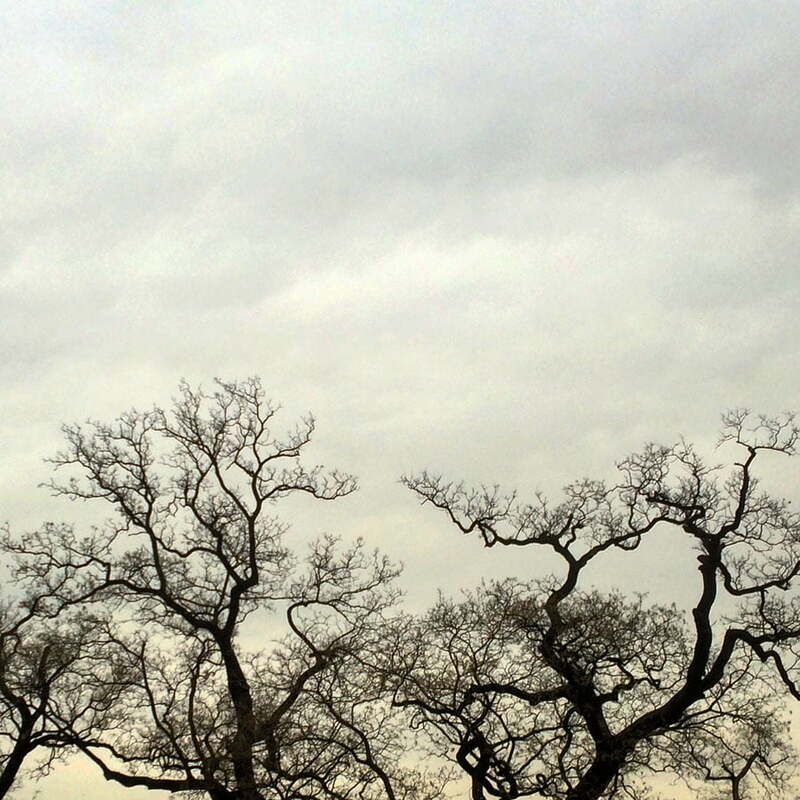 I love bare trees – the shapes are just so interesting! I’m a self-confessed person of the tropics – I’m used to handling hot sweltering weather but am a bit more useless in the cold. For most of this trip, me and my fellow Singaporean and Malaysian media friends spent it bundled up in woollen coats and Uniqlo heat-tech and still ended up shivering a fair bit. Meanwhile our Korean guide and other hosts were quietly amused at our antics to stay warm and claimed that this was a rather ‘warm winter’ by usual standards. That’s right folks, average temperatures in mid December 2015 were around -3 to 5 ºC and the locals are pooh-poohing the weather as ‘oddly mild’ for that time of the year. And that was evident especially when were in the mountains to ski – there was a lot less snow around. A few days later, the temperature dropped one day to -7 to -1 ºC and this was deemed ‘properly cold’. 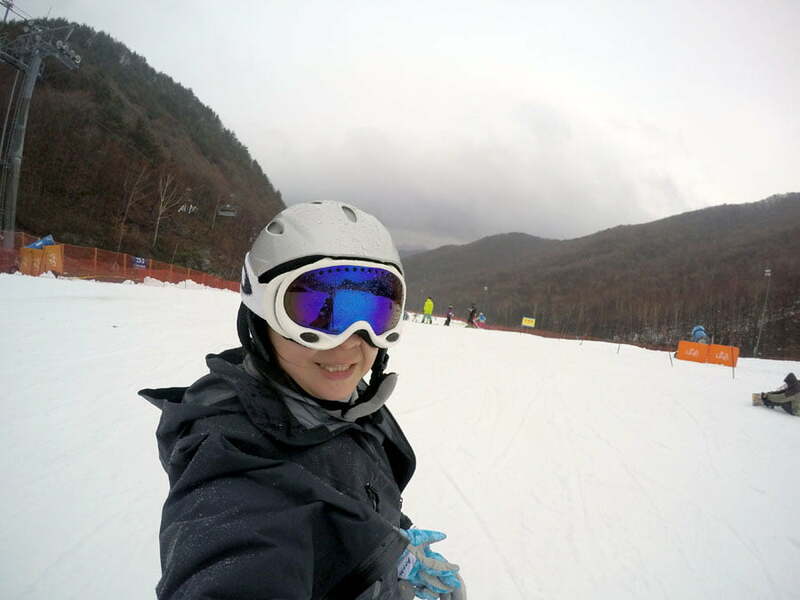 The highlight of the Gangwon visit was definitely getting a chance to ski at High1 Resort in Jeongseum, named because this resort has the highest elevation in the country at 1,345m, and a reputation for great powder snow for skiing. 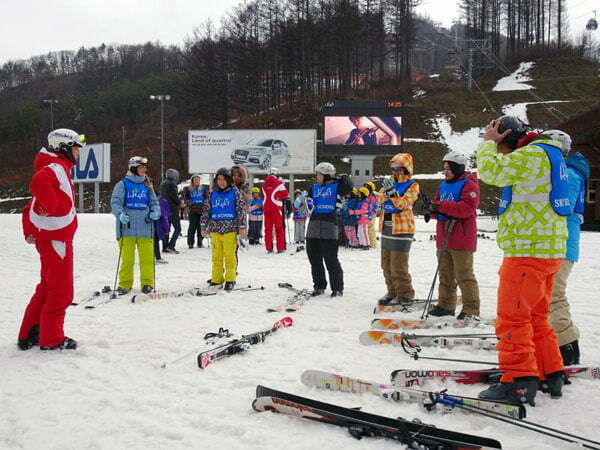 Those coming in straight from Incheon Airport will be happy to know that there is a direct shuttle bus during the winter season that takes you all the way to High1 resort in around 3.5 hours for 36,900 KRW – There are pretty detailed instructions at the High1 website. There are also buses that leave from various locations in Seoul. You can also take public bus to Singohan station or Gohan Station and transfer to a free shuttle bus to the resort. Like most ski resorts, there are several accommodation options here depending on your budget and propensity to ski. 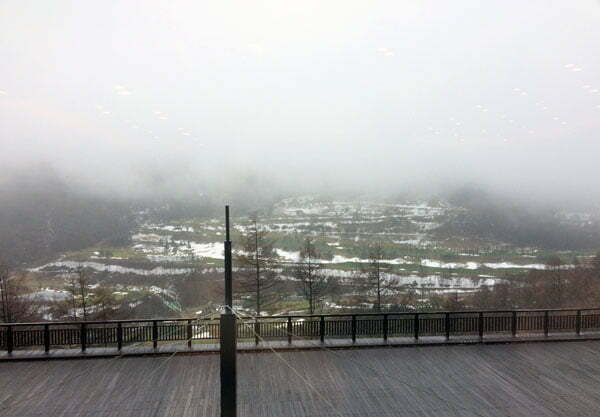 We stayed at the High1 Hotel which is at the top of the ski slopes and requires a shuttle to get to the ski slopes. 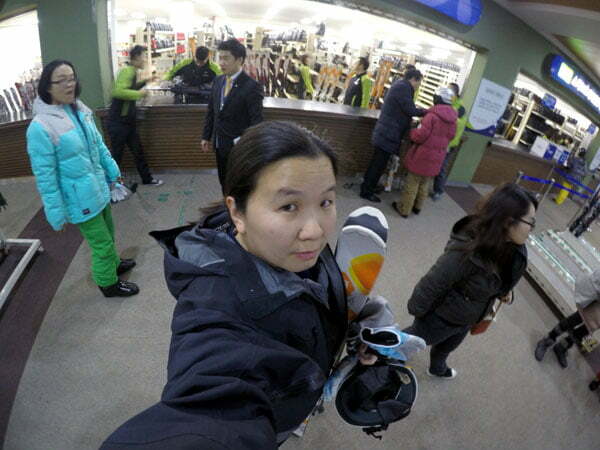 Avid skiiers can definitely consider any of the condominiums located at the base of the ski slopes, while those who rather not ski can check out KangwonLand, one of the few places in South Korea where locals are allowed to hit the casinos. We were only there for one night, so sadly we only had about 2 hours to ski after lunch and gearing up in the afternoon session. 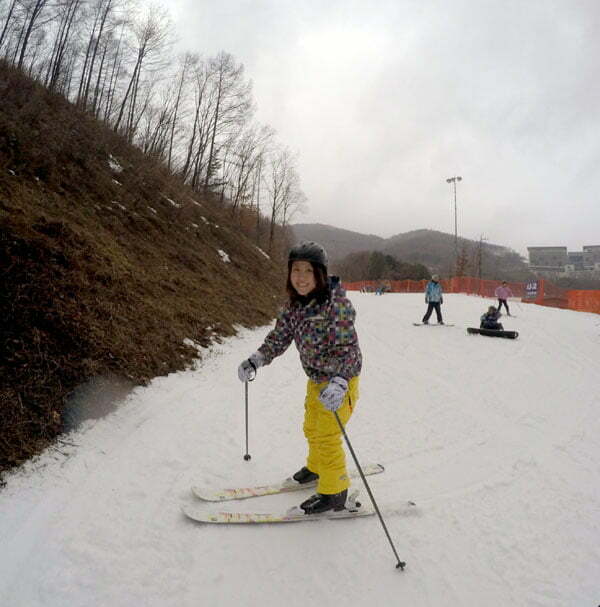 While most of the other media hadn’t skied before, M and I begged off the basic ski instruction and got to try our hand at the beginner slopes. Waiting for everyone to gear up! There are counters to get your skis boots, skis, ski poles and helmet from. We skied down from the Mountain Hub to the Valley Hub – You can see an interactive map here. I was trying to identify the route on the map and I think it’s Intermediate AT2 – M decided to take a break earlier while I kept on skiing down to the Valley Hub. From there I took a chairlift up, and it took me a bit further up than I expected. I ended up at the Valley Top right about 4pm where our time was up, skied as fast as I could back down to the Valley Hub and then took the gondola back to the Mountain Hub. I was a lot more careful this time around not to get stuck up an advanced slope with no other way down. I definitely learned my lesson after what happened to me when I was skiing in Hokkaido a few years back and had to get rescued by ski patrol. Managed to ski down without any mishaps, wooh for me! High1 Hotel Standard Room x 1 Night (2 pax): price ranges from 64,000 KRW in the Weekday Off season to 144,000 KRW in the weekend extra peak period. There’s a lot of opportunity to save if time it right. 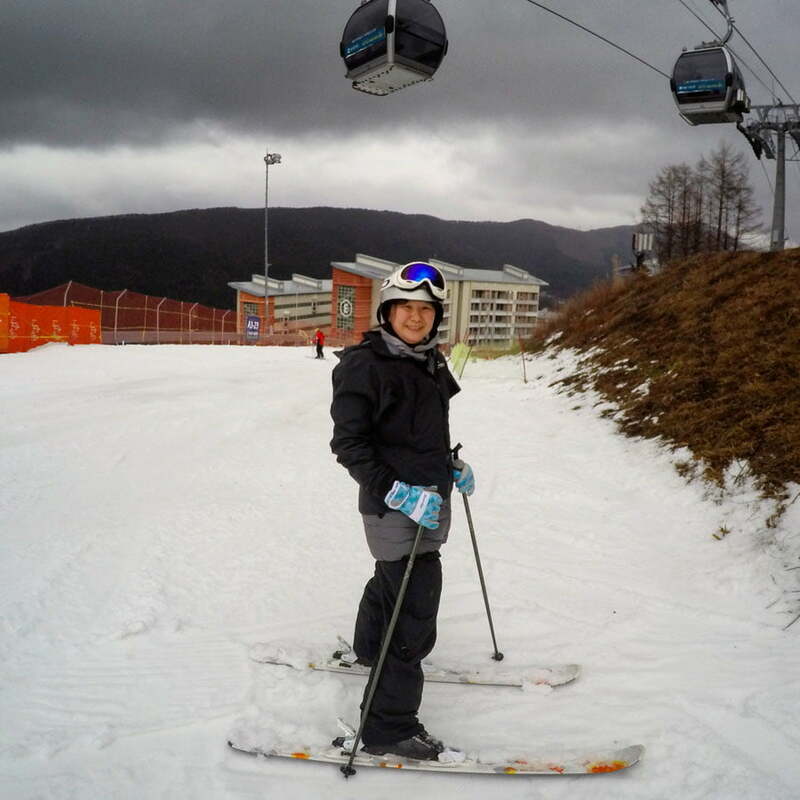 After all that skiing, we headed up the following day Pyeongchang and visited Alpensia, one of the main venues housing athletes for the Winter Olympics 2018. 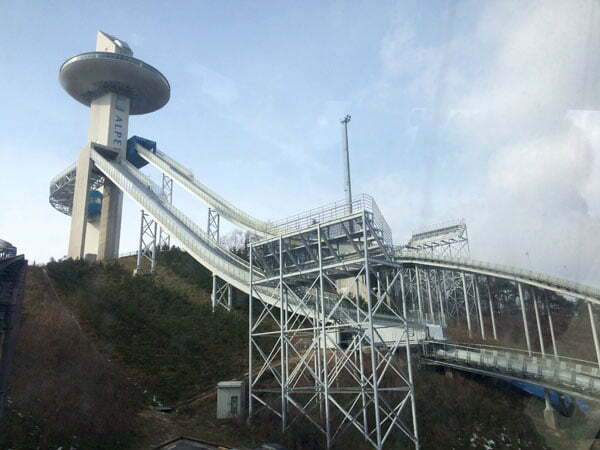 While we didn’t have time to ski here, our hosts took us to check out the Ski Jump Tower – we saw quite a lot of construction going on despite the cold weather as they are full on in prep mode for the Winter Olympics. You might notice that there is very little snow and it was a fine, sunny looking day. I can assure you that it was pretty windy and still extremely chilly despite that. 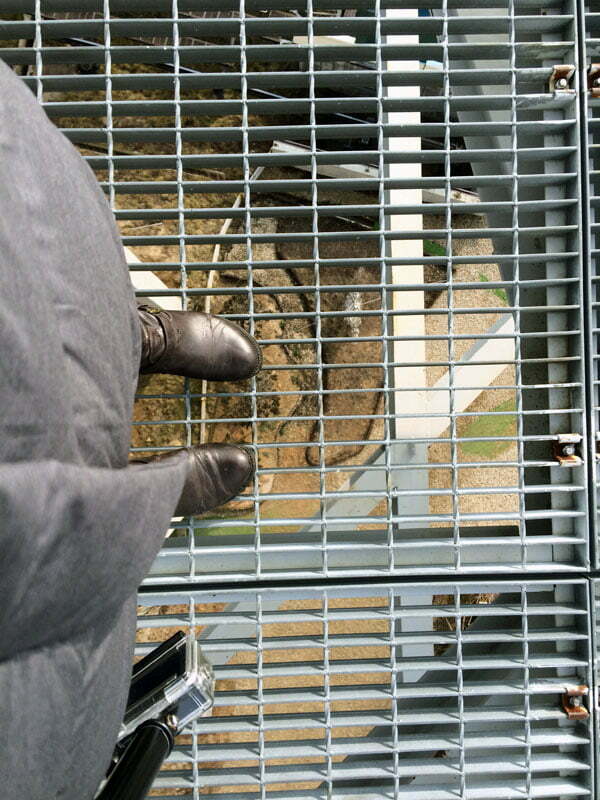 A mini tram took us from the field up to the base of the tower, and from there we took a lift up to the ski jump platform. 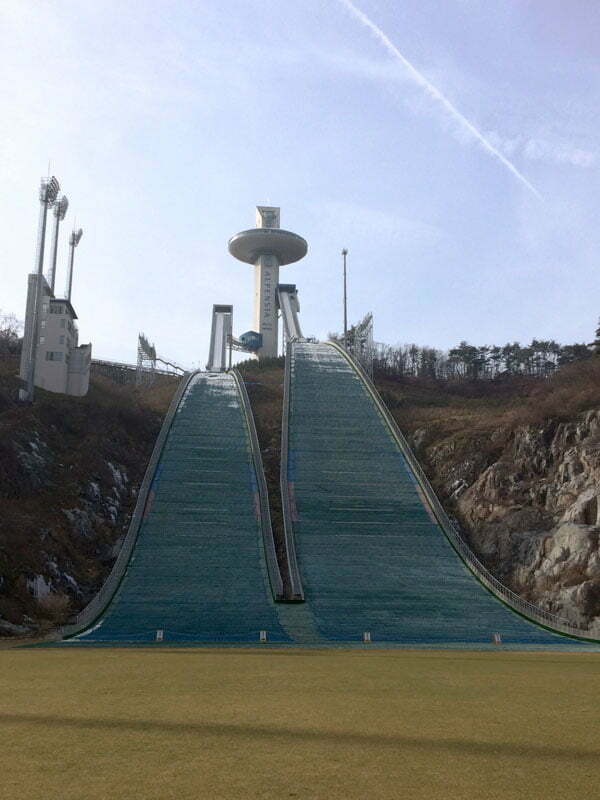 The public can visit the top of the tower, but the ski jump level is not open to the public, so it was a really cool experience for us to see what it would be like for the athletes up there. That white ramp on the side? 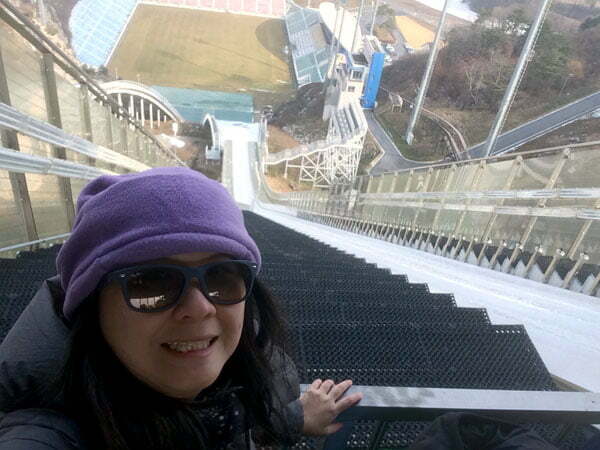 That’s where the ski jumpers slide down, down, down all the way and land in that field down below. It’s pretty surreal and scary! Here’s a more panoramic view of the area from an outside terrace – the ski slopes are on Mount Balwangsan, and if you notice to the left there is a blue bit – there’s a water park here! In summer when there’s no skiing, this place still continues to thrive with its other entertainment options. There’s also a huge concert hall here for K-pop fans! 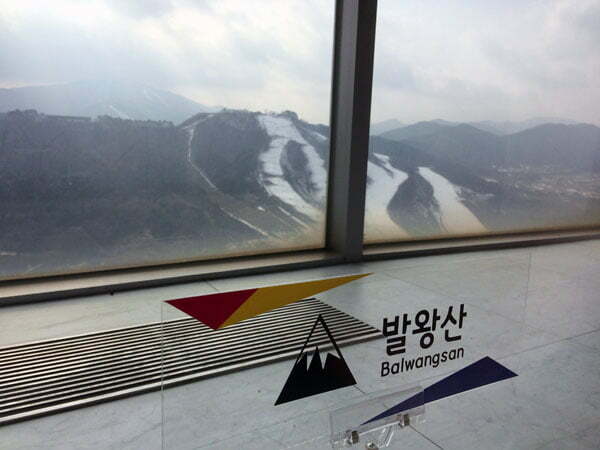 Like High1 Resort, you can get to Alpensia directly from Incheon airport or from Seoul, and it is accessible by public bus and car as well – Details here. Again, many thanks to Korea Tourism Organisation for this trip to Korea and letting me see a different side of Seoul and its surroundings, as well as Tripzilla who I worked with on this trip. Check out some of my other posts from this trip, or see all my South Korea posts. This article was updated in 2017. An earlier version of this article can be found at Tripzilla.